Find out how you can get involved with growing food, supporting the harvest, and helping our programs thrive at the Centre for Sustainable Food Systems at UBC Farm. New volunteer? Our updated registration system is up and running. Volunteer shifts have already started and will be available until Fall. Thank you for your interest in volunteering at the UBC Farm! Much of the great work that happens at the UBC Farm is made possible by the continued support of the Farm’s dedicated volunteers. 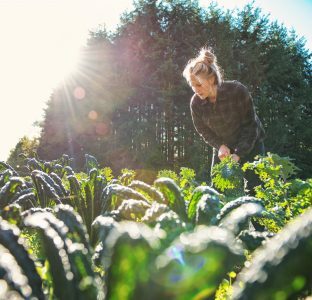 The UBC Farm volunteer program provides UBC students, staff, faculty members, and members of the wider community the chance to gain hands-on experience in many aspects of small-scale sustainable farming. Most volunteer opportunities are available during the main growing season (May-October) but there are often opportunities available as early as February and as late as November with the different programs below. New volunteers are required to attend a general Farm orientation before signing up for volunteer shifts. Come help us harvest and maintain the 200+ varieties of fruits and vegetables we grow on our 60-acre certified organic farm! This diverse position introduces and educates volunteers about all aspects of sustainable farming, from weeding to planting and harvesting. Urban Farmers play an important role in carrying out the day-to-day activities needed to run the UBC Farm’s field operations. If you want to get your hands in our fields, this is the program for you! 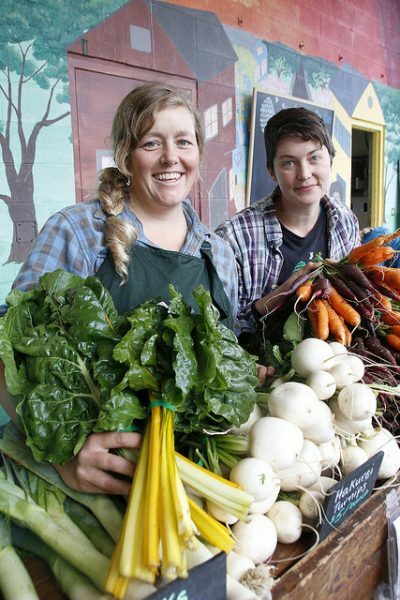 Urban Farmers have the opportunity to bring cull vegetables and fruit home after each volunteer shift, access a 20% discount at our markets after 10 hours of volunteering, and access a free UBC Farm t-shirt after 20 hours. The concepts of “food as medicine” and holistic health guide the xʷc̓ic̓əsəm gardens, one of the Indigenous initiatives at UBC Farm. Volunteer with these gardens to get hands-on experience with traditional foods and medicines, meet community members, learn, and share food. From planting vegetables to harvesting and drying medicines and from engaging conversations with Elders to sharing a delicious meal, volunteer time spent in these gardens is always enriching, no matter your skill level! xʷc̓ic̓əsəm garden volunteers are invited to take foods from the garden to take home at the end of each volunteer shift. Children’s Education Garden Care: volunteers at these shifts work with perennial fruits and herbs, annual vegetables, and a dynamic garden design. 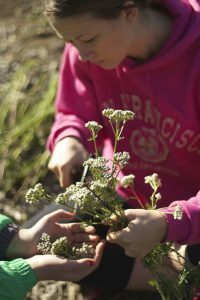 Join these volunteer shifts learn about growing food in a beautiful setting and in the context of the children’s programs that work out of this space. FarmWonders Summer Camp: volunteers support the Farm’s summer day camps for children aged 6-14. Volunteers are needed on a weekly bases from June 27 to September 2 and are asked to commit to an entire week of either mornings or afternoons. This is a great opportunity for individuals interested in gaining experience working with children on the Farm. For more information about the summer camp program, visit farmwonders.ca. 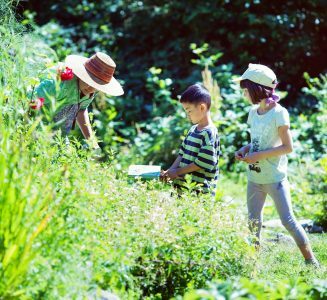 Children's Garden Care and FarmWonders Camp volunteers have the opportunity to access a 20% discount at our markets after 10 hours of volunteering, and access a free UBC Farm t-shirt after 20 hours. Landed Learning Farm Friends: participate in the Intergenerational Landed Learning Project with elementary aged children on a recurring basis during the spring and fall months. Volunteers share and cultivate their knowledge about growing and food production through hands-on activities in the Children’s Learning Garden at the UBC Farm. For more information, contact landed.learning@ubc.ca. Running from June to October, our lively Saturday markets require many helping hands. Market Crew members are in charge of setting up the market stands, selling our certified organic produce and generally running our markets throughout the growing season. Volunteers help out behind the scenes in our produce and flower area with our Market Crew. Farmer’s Market volunteers have the opportunity to bring cull vegetables and fruit home after each volunteer shift, access a 20% discount at our markets after 10 hours of volunteering, and access a free UBC Farm t-shirt after 20 hours. New volunteers are required to attend an orientation before signing up for volunteer shifts. Each UBC Farm program has slightly different volunteer requirements and expectations. Most programs welcome a diversity of backgrounds, experiences, skills, and ages. The Urban Farmers and Farmer’s Market positions have minimum age requirements of 14 and 16 years, respectively. All orientation sessions and volunteer shifts require advance registration via the online registration system. As many Farm programs rely significantly on volunteers, current and prospective volunteers are encouraged to choose programs that work with their schedules so they can commit to the hours required for a specific program. Learning and community opportunities are strengthened with each return visit. We strongly encourage people to commit to 20 hours per year if they want to help the UBC Farm. Please feel free to contact us with your questions or feedback, at 604-822-5092 or ubcfarm.volunteer@ubc.ca. For group volunteering inquiries, please visit our Community Group Visits page.